I got back on the wheel yesterday for the first time in a couple weeks. I have an order for some cups and tankards so I decided to knock those out. It was quiet and relaxing in the studio and I think my mind was relaxed knowing that all the rush for the year is over. I also made a jar just for the fun of it. It's a bit of a Janet Mansfield shape. I love Janet's woodfired, saltglazed pots. I especially like the ones that have really got salted and look as though the surface has melted a bit in the kiln. 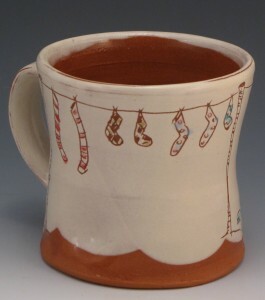 To continue my Love of Socks theme I posted this mug in my online shop this morning.